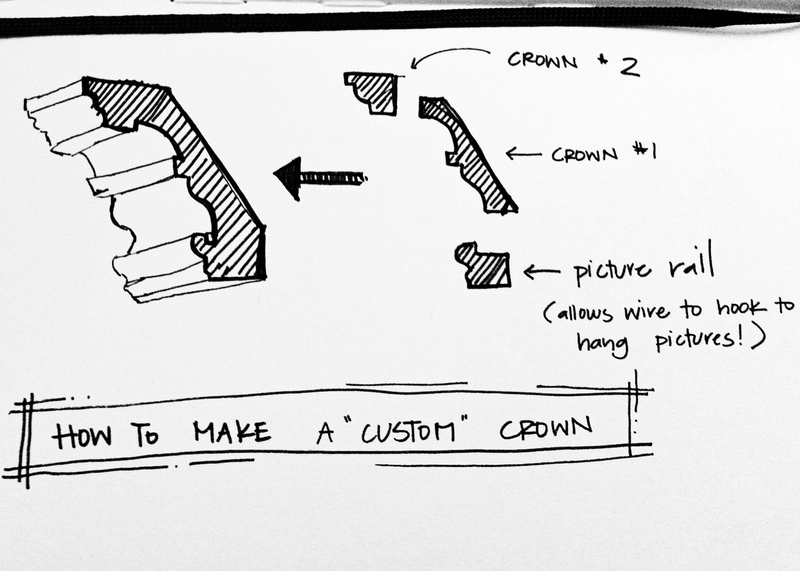 i’m sure, since this is a fancy house that i’m working on, we’ll have a custom crown made up to match the existing one exactly. that can be pricey though. because there’s a couple of pieces to it and it has a picture rail(it’s an old home with plaster walls so you don’t nail pictures into the wall) and you have to cut a custom knife. if i wanted to make a pretty crown like this at home, i’d put together a few prefabricated(less expensive!) trim pieces to make my own “custom” crown! a-ha. “genius” i heard you mutter under your breath. 🙂 but-nope, not my original idea… don’t ya know, this is a trade secret! so it’s just that easy- just put together a couple of different trim pieces to create your own! easy-as pie- right? !